New Year's Resolutions - I have mixed feelings about them. Do they help us achieve our goals, or are they just a passing fad, something discarded by the time the snow melts? I have been thinking for quite a while that I would like to get to know older picture books better, try to revisit old favorites like The Story of Ferdinand - or read books I really never remember, like Blueberries for Sal. I want to think about what makes these classic picture books sing to children, what draws children to them time and again. 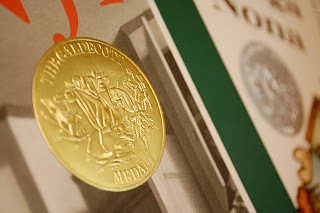 When teacher and library friends, part of the Nerdy Book Club (#nerdybookclub on Twitter - yes, really), started talking about reading all of the Newbery award winners, my thoughts turned to the Caldecott award. 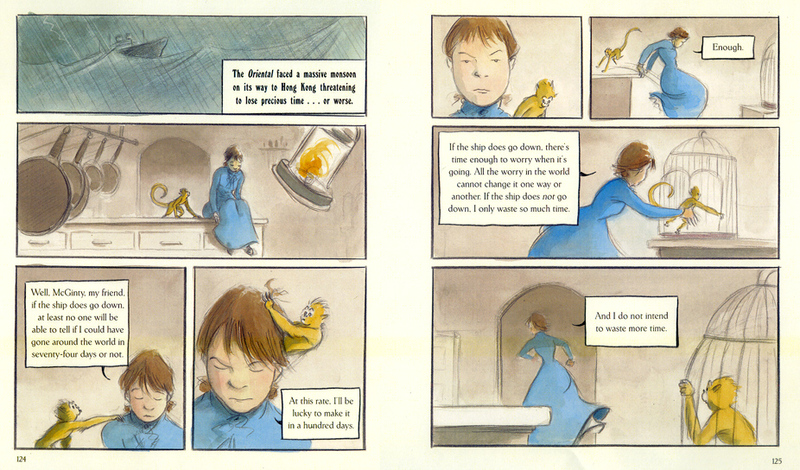 The Caldecott Medal is awarded annually "to the artist of the most distinguished American picture book published in the United States during the preceding year." This award, granted by the American Library Association, is not only a high honor for the winner but also a sign to parents everywhere that this is a truly special book. 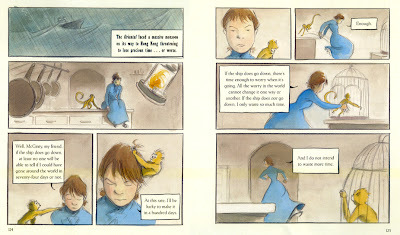 My goal for 2012 is to read as many of the picture books awarded the Caldecott Medal or Honor as I can. I will be reading both with a lens of history, trying to get a sense of what picture books spoke to children in the 1940s, 1950s and on. But I will mainly be reading these classic picture books to share books with children and families today, thinking about those that still make a wonderful read aloud, that still have beautiful art to share. Throughout the year, I hope to share my favorite Caldecott books with my Great Kid Books readers and with my students at Emerson. I also will be sharing favorites with my librarian and teacher friends through Twitter and Goodreads. If you'd like to join me, please do! Head over to the Caldecott Challenge organized by the wonderful librarians Laura and Anna over at LibLaura5 and A to Z Library. You can also read Laura's guide to creating a Goodreads shelf for this. Laura has started a great series at her blog documenting her reading with lots of great photos. 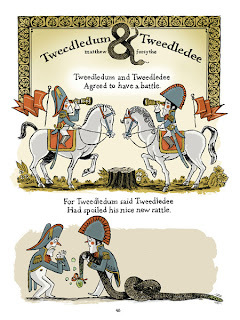 I've also had so much fun reading my friend John Schumacher's updates for his Caldecott challenge over at Watch.Connect.Read. Wish me luck with this New Year's Resolution. I'm starting with first reading some history about the Caldecott award and some of Randolph Caldecott's picture books. Then I'll start reading some of the first picture books awarded the Caldecott Medal or Honor. It should be a fun journey! The holidays can add a stress to anyone's life, but particularly for families coping with divorce. Change is hard for anyone, but particularly for children. I was particularly struck by Laurel Snyder's newest book, Bigger than a Bread Box, by how change can wrench a child from all her certainties. This is a wonderful book for kids who love realistic fiction, with a hint of fantasy. "My dad. My dad. My dad was so strong. He never cried. 'I don't know . . .,' he whispered to me. Answering a question I hadn't answered. Rebecca was angry and resentful when she got to her grandmother's in Atlanta. Unable to talk to her mom, she escaped up into her grandmother's attic. Amongst all her grandmother's things, she discovered a collection of bread boxes. One in particular drew her attention. And then Rebecca wished for a book to read up in the attic, and when she looked inside the bread box - there was a book. We all wish for different things, whether it's for tangible things we covet or for our situations to change. As Rebecca wrestled with fitting into a new school, she used the bread box to satisfy her wishes - but it would only bring her things, things that would fit inside the bread box. I especially liked the way Laurel Snyder layers character development, emotional dilemmas, and underlying questions into this heartfelt story. This is a book that will speak to kids, whether it's kids who have experienced divorce or changes that they don't have control over, or kids who connect to Rebecca's difficulties at school. Download the Bigger Than a Bread Box study guide. It includes writing prompts and information about Penny Dreadful. 100 Scope Notes: "The first-person narration is refreshingly honest. Rebecca is brought to life with a clear voice that readers will buy into." John Schumacher on 100 Scope Notes & Mr. Schu's Top 20 Children's Books of 2011: "I wish I could magically place Bigger Than a Bread Box inside the backpack of every fifth-grade girl who wishes her parents would get back together, or inside the locker of every reflective sixth-grade boy who wishes his life would return to the way it used to be." Anita Silvey's Children's Book-a-Day Almanac: "The problems of children facing divorce, the dark side of magic, the struggles of an engaging twelve-year-old not wanting to adapt to change—all these themes have been explored through superb storytelling." New York Times: " Snyder captures the divided household’s terrible sense of limbo and the helpless anguish and self-­involved fury of a newly adolescent girl, allowing no ties to form until the post-bomb dust has settled to reveal whatever new landscape has been obscured by its cloud." The review copy was kindly sent by Random House Books. If you make a purchase using the Amazon links on this site, a small portion goes to Great Kid Books (at no cost to you!). Thank you for your support. Our 2nd and 3rd graders love reading series, especially when they can connect to the main characters. One of their favorite series is the Clementine series by Sara Pennypacker, and the newest Clementine book will surely delight readers new and old. This also makes a great series for families looking to read aloud their first chapter books to 4 and 5 year olds. In my mind, Clementine is a little bit of Ramona and a little bit of Junie B. Jones, but a whole lot of her own person. Clementine is sure she’s in trouble again - why else would the “family meeting” sign be posted? No matter how much she begs, her mom just won’t tell her what the meeting is about. Clementine is used to family meetings where she has to think about being nicer to her little brother, being better behaved, trying harder. But nothing prepares her for the news at this family meeting: a new baby is on the way. Clementine is not taking the news well. Their family of four suits her just fine. "Four can be two and two sometimes, and nobody is lonely. Two kids and two grown-ups. Two boys and two girls. There are four sides to the kitchen table, so we each get one." Change is hard, and Pennypacker captures this pitch-perfectly in the 5th installment of this popular series for readers new to chapter books. Even Clementine’s best friend Margaret is changing in crazy ways. Having just returned from visiting her father in Hollywood, Margaret is now obsessed with makeup. 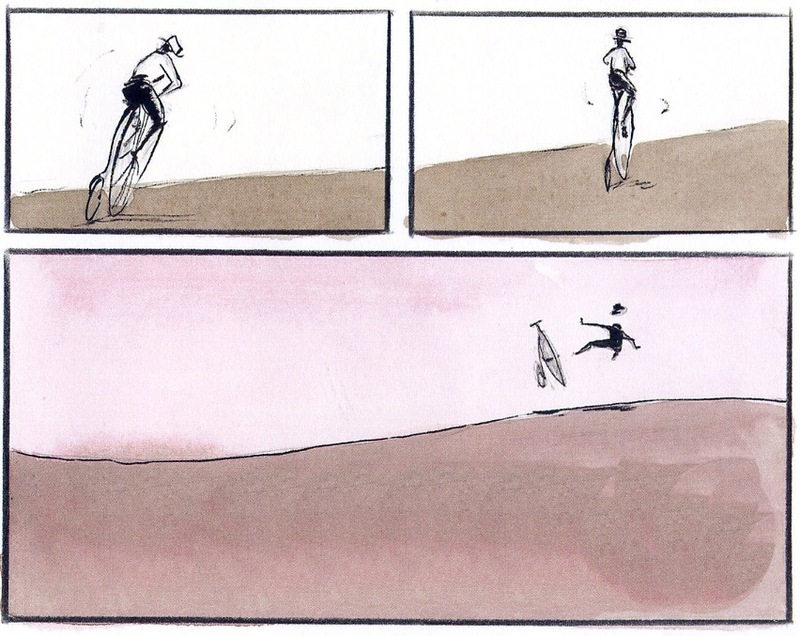 Clementine’s special relationship with her father is particularly touching in this story. He knows how to comfort her, joke with her and make her feel understood. Pennypacker, with Frazee’s line drawings, continues to portray a warm, supportive family that readers will relate to. Fans will be excited to learn that Pennypacker is publishing her first standalone novel since the Clementine series this spring: Betsy Bird reports that HarperCollins is publishing Summer of the Gypsy Moths - read more here at Fuse #8's Harper Colling Spring 2012 preview. The review copy came from the Association of Children's Librarians, my local review group. It was kindly sent by Disney / Hyperion Books. If you make a purchase using the Amazon links on this site, a small portion goes to Great Kid Books (at no cost to you!). Thank you for your support. My students adore comic books, and we have just gotten a collection that is delighting them. Nursery Rhyme Comics is a collection of 50 nursery rhymes, each illustrated by a different cartoonist. It is a real treat, especially for kids who already read many comic books. 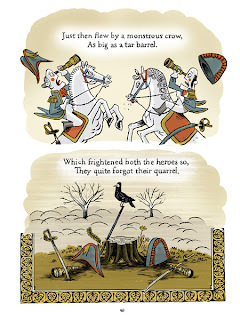 I love the way this is bringing classic nursery rhymes back into the experiences of kids ages 7 to 12. With 50 nursery rhymes illustrated by an talented array of leading cartoonists, this book is a visual feast. 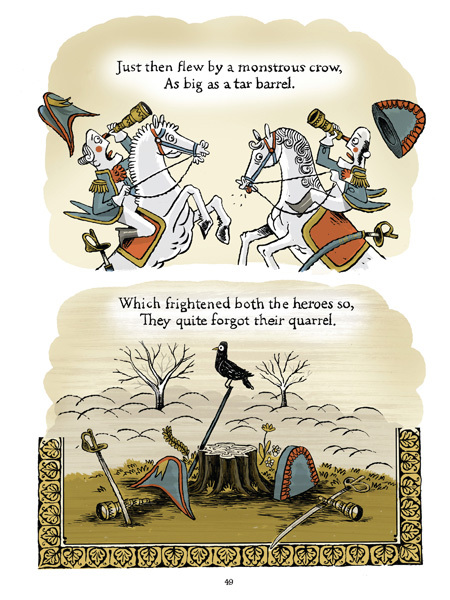 Each cartoonist was asked by editor Chris Duffy to interpret a different nursery rhyme, one suited to their particular taste or style. The result is a humorous, often quirky collection of some old favorites and some lesser-known traditional rhymes. Some pairings play off the cartoonists’ reputations - Nick Bruel, well-known for his Bad Kitty series illustrates “Three Little Kittens”, with the kittens ending up eating pie with messy delight. Other artists lend thoroughly modern reinterpretations. Lucy Knisley sets “There Was an Old Woman Who Lived in a Shoe” at “Ruth’s Rock & Roll Baby Sitting” where Ruth - a tattooed old rocker - entertains the children, inviting them to play with her band “The Whips” - and so finding a nice justification for the line “and whipped them all soundly” before she sent them to bed. This collection will certainly draw in readers who already love comics - they will revel in the sheer variety of the different artwork, returning to look at it again and again. But the audience is not the traditional nursery rhyme audience of preschoolers and toddlers. Hand this to a 3rd, 4th or 5th grader and they will love the quirky, fresh illustrations, and delight in reading nursery rhymes they learned as little kids. The review copy came from the Association of Children's Librarians, my local review group. It was kindly sent by First Second Books and Macmillan. If you make a purchase using the Amazon links on this site, a small portion goes to Great Kid Books (at no cost to you!). Thank you for your support. I adore the way you pull children into reading, delighting them at every step. I smile each time I check out your books to girls AND boys, young and old. You are the most popular series in our school library, month after month! I laugh each time a child tells me how funny you are, or how much you make them laugh. And I smile each time I read your stories and realize how many nuggets of truth are buried inside your pages, like chewy goodness inside my favorite candies. A Very Babymouse Christmas is the newest in the popular graphic novel series by the sister-and-brother team Jennifer and Matthew Holm. Our students, ranging from 2nd grade girls just starting to read to 5th grade boys who can't get enough graphic novels, love love love Babymouse - and I'm talking a *rush right to the shelves* "Ms. Scheuer, do you have any Babymouse books in please?" kind of love. A Very Babymouse Christmas is a pitch-perfect addition to this series. It's almost Christmas, and Babymouse is thinking of the presents she really wants for Christmas. OK, she's not just thinking about presents - she's obsessed with presents, one present to be specific. All Babymouse wants for Christmas this year is a WhizBang gadget. "It plays video games and movies, it texts, sees into the future, folds laundry, and does homework!" Kids (and parents) will certainly connect with the way Babymouse is just dying to have this newest, greatest gadget. But, as usual, nothing goes quite right for Babymouse. As always, Babymouse's daydreams rescue her from her not-so-glamorous life. Her Christmas daydreams take her into the Babymouse version of A Christmas Carol (featuring the scary Ghost of Mean Girls Past) and a Babymouse Nutcracker. Kids will laugh at the way Babymouse is completely fixated upon a new WhizBang, but they'll also realize how their own obsessions can get out of proportion. My favorite scene of all is the ending, where Babymouse discards her new WhizBang to play with her little brother Squeak. With the WhizBang tossed aside, they spend hours playing with Squeak's dollhouse - in perfect togetherness. It's a moment that rang true for me and warmed my heart to see. The review copy was kindly sent by Random House, but we've bought many copies since, for our school library, classrooms and friends. If you make a purchase using the Amazon links on this site, a small portion goes to Great Kid Books (at no cost to you!). Thank you for your support. Dinosaurs fascinate many young children. These huge beasts dominated the world, and yet they vanished leaving only a few traces behind. Preschoolers and kindergartners love the sense of power that dinosaurs bring - there's nothing better than stomping through the sand box pretending you're a giant dinosaur on the hunt. But these young children also soak up scientific information as they learn about dinosaurs. If you have a dino-lover, check out the new book app: Magic School Bus Dinosaurs. Ms. Frizzle takes her class on a field trip to a dinosaur dig to investigate how dinosaur bones are uncovered. The paleontologists at the site have discovered some Maiasaura dinosaur bones, but are disappointed that they haven't discovered any eggs. Ms. Frizzle has the perfect solution: her class will travel back in time to see if they can figure out where the Maiasaura's nests are. The bus transforms to a time machine and takes the class back to the Late Triassic period, then moves forward through the Jurassic and Cretaceous periods. Ms. Frizzle and her class discover which animals and plants lived during the different eras. Along the way, different class members share short reports with readers. The app stays true to the original Magic School Bus book, making it accessible for a nice range of audiences. I've found that young children, ages 4 - 7, adore the wacky Ms. Frizzle but are often unable to read these busy books on their own. This app uses engaging narration along with a well designed interactive app to pull young children into discovering this interesting scientific information. Children listen to the main text, but then they tap speech bubbles to hear what different characters are saying. This means that kids are actively engaged with reading this story, not just passively watching the movie roll by. Kids also are enjoying the interactive games, digging for fossils and then dragging the dinosaur bones to the correct place on the whole skeleton. Along the way, they collect special dino cards, with facts about the different dinosaurs they have uncovered. The app does not include any extra nonfiction visuals, the way that the Magic School Bus: Oceans app does. It would have been very interesting if the developers included some photographs of fossils or dig sites, or short videos of paleontologists at work. The iPad apps have great potential for combining different materials, the way that the Magic School Bus: Oceans app did. If you have a child who's fascinated by science or dinosaurs, this is definitely an app worth exploring. Read an interesting interview with the producer at Scholastic Media about developing Magic School Bus: Dinosaurs iPad app at the Scholastic Blog Ink Splot 26. Read another review over at School Library Journal's blog Touch and Go. The review copy was sent by the publisher, Scholastic Media. If you make a purchase using the Amazon links on this site, a small portion goes to Great Kid Books (at no cost to you!). Thank you for your support. Take a graphic novel and an adventure story, and kids are going to love it - right? Add in real life adventures from the late 1800s, and you've got yourself something really interesting. Matt Phelan's newest book, Around the World, is a wonderful book to open kids' reading world. They'll read about three real-life adventurers who traveled around the world in the late 1800s, inspired by the fictional journeys of Phileas Fogg in Around the World in 80 Days. 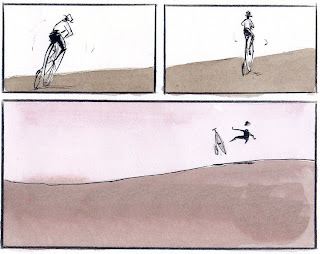 Award-winning graphic novelist Phelan chronicles the real-life journeys of three nineteenth century adventurers who each set out to circumnavigate the globe for the sheer challenge of the journey. While the nineteenth century was full of Americans pushing boundaries and exploring new territories, these three were each inspired by Jules Verne’s best-selling novel Around the World in Eighty Days. Thomas Stevens rode a high-wheel bicycle from San Francisco to Boston, and then continued around the world with or without roads. Just look at the spread above and you can get a sense of Stevens' crazy determination, starting in San Francisco of the Gold Rush era and venturing first across the US and then across the world. Journalist Nellie Bly set out in 1889 persuading the editors at the New York World to sponsor her journey around the world, as she attempted to beat the record of Verne’s protagonist, Phileas Fogg. She not only had to beat Fogg's fictional record, she also had to overcome her editors' doubts that a woman could really accomplish this on her own. Bly was stubborn and determined, as well as courageous. And finally Phelan shares the story of seaman Joshua Slocum who sailed around the world by himself, the first person to do so alone. As we read these stories, we are fascinated by these adventures, but we also find ourselves asking, "Why? Why did these people decide to go around the world? And what kept them going?" Phelan shares not only these adventurers’ public travels, but he also explores their internal journeys. As he writes in an author’s note, he focuses not just on what these real-life characters did, but why they undertook these challenges, what motivated them, what emotional baggage they brought along on their journeys. 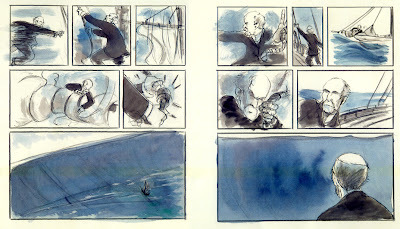 The stories are brought to life by Phelan’s illustrations: washes of color set the tone, emotions and reactions are masterfully conveyed in the distinct characters, and the layout and design of the panels visually moves the action along. Kids in 4th and 5th grade have loved this book. They are swept into the lives of these nineteenth century adventurers by the visual appeal of Phelan’s artwork, but they have been held by his masterful storytelling. 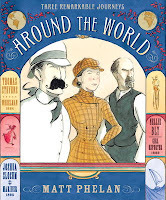 Around the World has received four starred review, and is featured on the Kirkus Best Children’s Books of 2011, and has been included in 100 Scopenotes and Mr. Schu's list of Top 20 Books of 2011. Around the World is copyright © 2011 by Matt Phelan, and published by Candlewick Press, Somerville, MA. Images reproduced with permission of Matt Phelan. The review copy was originally sent by the publisher, Candlewick Press, and I have bought several copies since. If you make a purchase using the Amazon links on this site, a small portion goes to Great Kid Books (at no cost to you!). Thank you for your support. We ♥ Todd Parr (ages 2 - 8): a fun school visit! 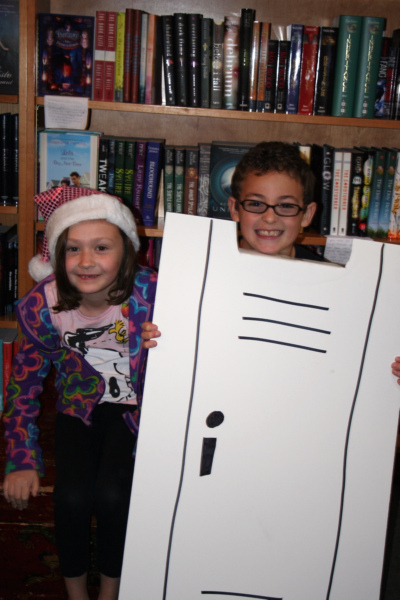 All of Emerson was abuzz last week with excitement for books and reading. 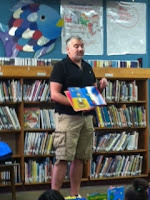 Todd Parr, a wonderful author and illustrator, came to visit our students and share about his books. As so many of the kids said, "We love you, Todd." You see, he ends each book with a note that speaks directly to kids, and he signs these notes, "Love, Todd". I truly believe this helps kids connect with Todd as a person, and they return his love adoringly. Todd Parr is the author of over 30 books. Every one of Parr’s books helps children feel good about themselves and helps families talk about all kinds of things that kids really do care about. 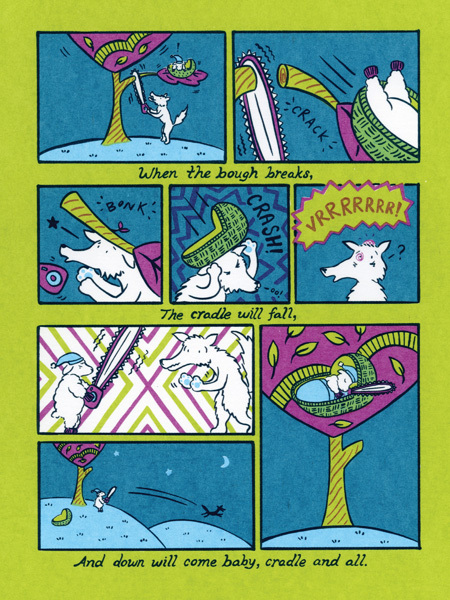 Parr illustrates his stories, creating bright, colorful artwork that will bring a smile to your face. Through every book he shares the message that it’s OK to be different and important to believe in yourself. During his visit, he read several of his stories aloud to the kids, asked for their help drawing silly pictures, and played a great improvisation game with the kids. The students laughed, giggled and begged to participate. I especially love talking with the kids about how Todd's grandmother read with him when he was a child. He loved reading his favorite books over and over again. Todd talks about how his grandma would ask him what would happen next, and he would create crazy imaginative predictions. She encouraged his creativity and helped him connect to the books they were reading. In talking with the kids afterward, they especially loved seeing Todd draw right there in front of him. They love noticing things in his artwork. Kids have described his style as simple, but full of details. They like the way it looks like a kid could draw it, but they clearly notice that he takes care and effort. Todd's books are perfect for preschoolers and young elementary students, but older students read them with joy and smiles on their faces. At Emerson, we had all of our kindergartners, 1st and 2nd graders come to the library to listen to Todd. But, a group of older kids also came along - these 10- and 11-year-olds loved listening to him just as much as their little brothers and sisters! Each is filled with Todd's humor, heart and kindness. We truly appreciate Todd's taking the time to share a little bit of himself with us. One of my favorite books as a young child was Harold and the Purple Crayon. I can't actually remember reading it, but whenever I read it now the feelings and memories flood back to me. The wonder as Harold draws his world, whatever he wants to see. My amazement at when his hand shook and water appeared behind him. And my delight when he was so clever that he realized he could draw his own window around the moon. I was so happy to see that the new iPad/iPod book app remains true to the original story, but brings it to life in a new way. It's a real joy, one that I highly recommend for young children. Harold is a little boy who decides one night to climb out his window for an adventure. He isn't sure where he should go, but he decides to create his own adventure - drawing it each step of the way with his purple crayon. It's a wonderful celebration of children's imagination. The book app "Touch Tale" incorporates wonderfully paced narration with just the right amount of interactive features. Children are invited to draw along with Harold, tracing over gray lines that become bold purple when the child draws them. But you also can discover hidden treasures, like swiping over the empty sky to reveal twinkling stars. When Harold gets to the city, the careful reader will notice that there is a cat hiding in one of the windows which you can tap on to zoom in to see. Harold's journey is animated, but in a way that stays very true to the simplicity of the original story. You follow Harold through his imaginary world, seeing the dragon roar or the ship sailing. But most of the details of this world are still left to the child's imagination. The pacing and narration fit the story perfectly for a young audience. The app "chunks" the original picture book pages, so that only one line appears at a time on the screen. This helps children see the words at a nice, slow pace and large enough to see clearly. If you tap on different items in Harold's world, the word labels will pop up - helping children develop an awareness of printed words. But best of all is the soothing voice of the narrator - perfect for a bedtime story. This is a joy to read, and drew me to it time and again. It's a perfect example of a book app staying true to so many qualities of the original book, but making it accessible to a young child in a new way. I am looking forward to reading Harold at the North Pole (released 11/29/11). Psst, don't tell - but I'll be getting this for my niece and nephew, along with the print book. I think they will enjoy the app, and also enjoy reading the print book. It will be interesting to see if the app stimulates interest in the book, or if they shun the book in preference for the app. The review copy came from our home iTunes library collection. I am excited that the School Library Journal has included several apps for tweens and teens. In today's post, I will round up the Best Apps for 2011 that have been recommended by the School Library Journal. While I have not had a chance to explore many of these, I wanted to share them with you. The biggest trend that I see is how iPad apps can bring alive nonfiction, embedding a variety of photographs, images, video and live links that readers can explore while they're reading. I'm also very happy to see some apps for tweens and teens to continue using audio narration to pull in readers. I hope more include narration as an option on these longer texts too. 1. Touch Press apps such as Gems and Jewels, The Waste Land, and March of the Dinosaurs. My friend Paula Willey (of PinkMe) shared Gems and Jewels with us at KidLitCon, and it is a truly beautiful app. Kids and grownups alike will love exploring so many different facets of these stones and how they've been used through the ages. I haven't seen the others, but look forward to checking them out. The nonfiction apps are great for tweens and teens, either browsing on their own or maybe reading with a parent. 2. Paris AppTours: Beware Madame La Guillotine (Time Traveler Tours): I have not listened to this audio tour yet, but I'm absolutely fascinated! Here's the beginning of the review on SLJ's Touch and Go: "Drama of historical proportions, an awesome guide, and games and challenges, what more could a teen on vacation ask for? In Beware Madame La Guillotine (Time Traveler Tours, LLC) Sarah Towle offers iPhone and iPod users a tour through the streets of Paris with stops at the sites associated with the French Revolution and the Reign of Terror. Their guide? Charlotte Corday, the 24-year-old from Normandy who killed journalist and Jacobin leader Jean-Paul Marat in his bath in 1793." What fun! 3. Jack Kerouac's On The Road (Penguin / 1KStudios): I'm fascinated by the way this app combines the complete text with "a rich variety of print resources, video and audio recordings, and visuals culled from Viking's archives and the Kerouac estate." SLJ's review recommends it for grades 9 and up, and I can indeed imagine many high school students interested in this rich, multimedia approach to exploring Kerouac's work. Take a look at this preview video to get a sense of this rich resource. You can clearly see that nonfiction apps are leading the way for engaging tween and teen readers. I would love to hear from readers whose older children have explored any of these apps. At times I wonder if kids will want to sit and read the content, or if they will be distracted by the bells and whistles. The key is finding an app that stimulates a reader's interest, making them want to learn more. And then making that reading accessible and interesting. Thanks very much to Daryl Grabarek, the editor at the School Library Journal's blog Touch and Go, for a fascinating, well-rounded list of the Best Apps of 2011. If you are interested in this topic, definitely follow Touch and Go for their thoughtful, interesting regular reviews of book apps for a wide range of children. I'm finding the hardest thing about book apps for kids is discovering ones that are really good. That's why I was happy to see that the School Library Journal came out with a list of their favorite apps for 2011. I'm going to divide their list into age groups. Today, I'll share their apps that work for younger kids (ages 2 - 10). Tomorrow, I'll share the apps they're recommending for tweens and teens. 1. Pat the Bunny (Random House / Smashing Ideas Inc.). I haven't had a chance to see this app - on the face of it, it seems so odd that Pat the Bunny is an app. But I've heard from many places that this app is engaging with perfect age-appropriate interactive elements. It's a difficult balance to achieve, and I'm looking forward to trying this out with my young nephew. 2. The Fantastic Flying Books of Mr. Morris Lessmore (Moonbot Studios): this app is truly captivating, in my opinion. As I wrote in the SLJ review on their blog Touch and Go, "With a stunning combination of computer animation, interactive features, and traditional picture-book elements, William Joyce and Moonbot Studios have developed an enchanting story about the power of books. Based on their award-winning short film, this production sets the bar high for picture-book apps." Indeed - my 7 and 10 year old both read this book over and over again this summer. 3. Spot the Dot (Ruckus Media): David Carter's app combines his creative books with a find-and-seek game. Preschoolers and kindergartners will love searching for the hidden dot, following the progressively more difficult challenges with each turn of the page. I am fascinated by this blend of a book and a game. Each time you open this app, the dot changes its hiding place. We had a lot of fun with this app! 4. Hildegard Sings! (One Hundred Robots) I can't wait to get this app by Thomas Wharton. 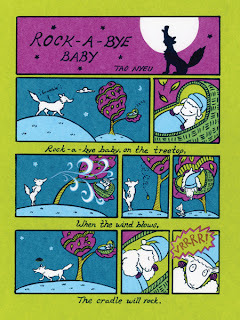 Betsy Bird of Fuse#8 nominated it for the Cybils Book App Award, and says that it's hilarious. Here's SLJ's description: "Hildegard, a flamboyant hippo, works as a singing waitress, but dreams of becoming an opera star. When she croons off-key, listeners experience it firsthand. Add to that flashes of melodramatic lightning, orchestra music, amusing interactive features, and a few games, and you have a flat-out funny, immensely entertaining theatrical production that hits all the right notes." 5. Cinderella: A 3-D Fairy Tale (Nosy Crow) has been a big hit both with students at Emerson and here at home. Of course kids love this story, but Nosy Crow gives it a fresh new multimedia twist with great illustrations, bouncy interactive characters, and fun dialog bubbles that pop up when you touch the characters. This has definitely been one of our favorites of the year. Tomorrow, I'll share the apps that the School Library Journal has recommended for tweens and teens. I don't know these apps as well, so am looking forward to exploring them! Today I was interviewed by Robin Young of NPR's show Here & Now about book apps for reluctant readers. I was very excited to be able to share all that I've learned about this new way for children to read and listen to stories. Come listen to the interview - I'd love your thoughts! Head over the the Here and Now site and click "Listen" right under the article title. I often hear people saying, "But is watching and listening to a book app really reading?" In fact, Robin asked me if I'm a librarian, shouldn't I really be in the business of wanting kids to read books? It reminds me of the debates about audiobooks. Listening and watching these book apps is a way of experiencing stories that will pull in many children who won't sit and read a book on their own. It's a way of providing a way into stories, and with the right support and motivation, they will be able to read them on their own at a later point. My brother would have loved the way these apps bring stories to life. My goal is finding the book apps that really do capture children's interests and make them excited to read, to listen to stories, to learn about the world around us. I am convinced that once we can open a child's eyes to the world of imagination or the wonders of the real world, and we can share how our stories make these come alive, we have won half the battle. To read more reviews of book apps on my site, check out this link: ebooks.